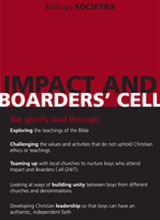 Impact is the name given to one of the acting Christian Unions at Bishops. We aim to make an ‘impact’ in the school and in the community around us in the name of Jesus, and help boys to find ways to express, explore and find their own personal faith in God. We seek to make Impact a relaxed meeting place where any Bishops boy can feel welcome to investigate and examine his faith in an open and non-threatening environment. We meet weekly to strengthen our faith in God and explore what it means to have a meaningful relationship with Him, celebrating the life we’ve been given. From discussions on various challenging topics, listening to guest speakers and prayer meetings to outreach events (e.g. sandwich drives), video sessions and even the occasional sports session, we do a wide range of different activities, with the common factor being trying to do everything we do to the glory of Jesus. In addition to our weekly meetings, we occasionally organise evening gatherings and participate in other Christian events and socials with other schools in the vicinity of Cape Town. One of such events is Impact Café, a termly Café held outside the Molteno Library, where we serve pancakes and bring in other food and drinks to raise funds from donations for different causes or charities, whilst chatting with other boys around the school and discussing topics surrounding God and the Christian faith. Another event is Schools United, a gathering of Christian Unions (CUs) from around Cape Town to meet once a term in the evening to interact with students from the other schools. Bishops and Herschel host the Schools United events alternately each term, and over the years we have gained incredible insight and knowledge about how we should be living our lives for Christ. Impact has the privilege of attending the annual camp hosted by the Rustenburg and Rondebosch CUs. This camp involves a number of schools from around the Cape and is a massive collaboration of Christian students for a weekend, usually at the Rocklands Campsite in Simon’s Town. During this weekend away, the students participate in a vast array of activities, including talks by guest speakers, extensive discussions, powerful worship sessions and bonding sessions, as well as plenty of free time to enjoy the event and the facilities.